After breaking up with my college sweetheart, I moved to Jerusalem for grad school. Almost immediately and back to back, I found myself in two different relationships with people who didn’t want to be with me. Even though I have a travel bug and loved living abroad, it was emotionally one of the darkest times of my life. I got to a point where I couldn’t handle my emotions anymore, so I reached out to a therapist. If you missed the full Part Two of my love story, read it HERE. If you missed Part One, read it HERE. As I was finishing up grad school, I was applying for jobs like crazy. I was pretty much over both of my exes, and I was ready for something new. And my new job landed me in Charleston, South Carolina. I had really hoped to find a job in a place like DC, New York, or Chicago, because I wanted to meet a nice Jewish boy, but after a couple of years of feeling unsteady from my last two relationships and living abroad, I was excited to be close to home. I grew up only five hours away in Asheville, NC and most of my family lived in the upstate of South Carolina. As horrible as I told you I was emotionally in the last installment of this series, things quickly got that much better. The person who’s job I took put me in touch with a young adult leader in the Jewish community, which gave me an instant in to an amazing friend group. When I moved to Charleston, I had just over $3k in the bank. But that money didn’t even belong to me, it was just my leftover student loan money! But I had gotten an amazing steal of a studio apartment in the heart of Charleston so I was able to quickly pay off over a quarter of my loans in the first year. I also saved more money than I ever had before. Being abroad had helped me to get to know who I was and what my values were. And I finally had my own money, where I could spend my money based on those values: my money went towards yoga classes, travel, and organic food, and less towards clothes and going out to eat. I tell you this because this was really the first time in my adult life that I felt, well, like an adult, but also like a whole and complete person. Before, my life revolved around finding my husband, but now it revolved around what I wanted and then creating it. Piece by piece, I literally built the life I wanted. I met a group of friends at work and in the Jewish community I loved, I found a yoga studio that felt like home, and I had my own money. Dating was in the back of my mind for sure, but for the first time ever in my life (at least since I was 11), it wasn’t the first thing I was always thinking about. I had spent a lot of time rebuilding myself emotionally with my therapist, and now back in the US, I was rebuilding what my life was on the outside. So wouldn’t you know, just a few months after moving to Charleston, my friend there set me up with a nice Jewish boy. And boy was he nice. He was an officer in the military, so that was hot, and his manners were impeccable. He picked me up for our first date, which by the way, had never happened to me before. Before it was always, a “hang out” or a “let’s meet up here” kinda thing. He was kind, he was attentive, and he was fascinated by my experience living in the Middle East. After our date, he dropped me off, told me he had a nice time, and immediately asked for a second date, which of course I said yes to. We dated for about 6 months, and even though in the end the feelings just weren’t there, the whole idea that dating could feel like that, that there were guys out there like him, and that there were guys who were respectful, interested in me, and AVAILABLE was all brand new. I told myself that this guy would be my new standard. If at any point in the future anyone acted less than him, it was over. More than that, I also felt like I had enough confidence and self-respect for the first time ever to actually hold myself to that standard. Before, if you recall from Part Two, I would desperately try to make something work because I couldn’t handle the rejection of it not working out. The next year and a half I lived in Charleston I dated here and there, but it wasn’t really priority. And that felt really good. I was taking advantage of living in Charleston and nurturing some friendships with people I’m still friends with today. I met a guy and he asked me on a date, which I said yes to. On the evening of our date, I left work early because I was applying for a job that had a pretty extensive application… and a deadline. I texted him to tell him I was working on an application that was due soon and that I’d be working on it until he was done with work, and then I’d meet him at his office, and we’d go to the restaurant together. Well, this guy owned his own business, and I think he wanted to show it off to me. So he texted me that he was finishing up work, so I headed over to meet him at his office. He wasn’t really finished up with work, so I sat there while he called different people into his office having silly meetings, and he was halfway talking to me and halfway typing on his computer. I sat there for 30 minutes until we left for dinner. I went to dinner with him, but I knew I wouldn’t go on another date with him. This doesn’t seem like that big of a deal, right? But I had finally reached a point where I had a enough self-respect to know my time was really valuable, and it was incredibly disrespectful of him to have me wait on him for 30 minutes so he could show off, when I told him I had a deadline. Before, I’m pretty sure I would’ve played into his game and written off this behavior. Finally, I was confident things had really changed for me. But then, Obama called. Well, not Obama himself, but his campaign did. And they wanted to hire me. More on that… next week! 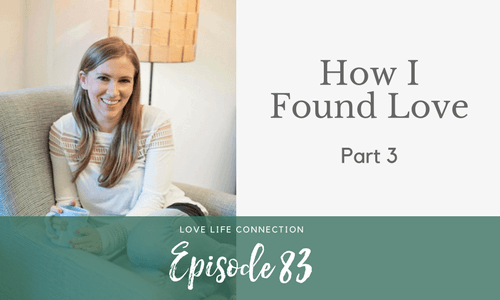 EP88: How do I know when I’m ready to date or when I should pull back?